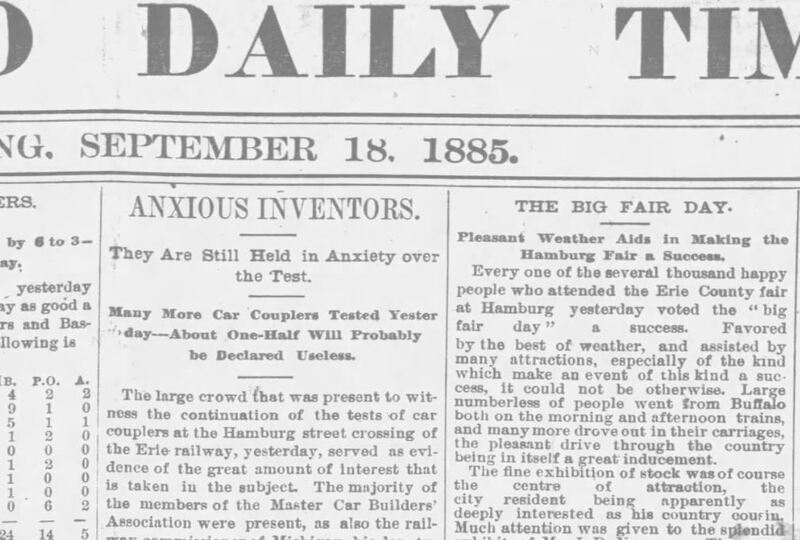 On this day, September 18th, 1885, the last day of the Erie County Fair, Hiram P. Hopkins woke up to threatening skies. While the weather appeared ominous, he breathed a sigh of relief. He didn’t see the clouds as presaging rain. Rather, he saw the southwesterly breeze as ushering in unusually warm temperatures. In exchange, he’d accept the oppressive humidity. In the early morning, before the expected thousands of fairgoers arrived, Hiram strolled the grounds. Just a day earlier, the place was packed, the crowd so dense it was difficult to move. This morning the only people Hopkins could see were the many vendors prepping their booths for the final day. Popcorn, peanuts and candy sellers had a brisk business the day before. The same was true of those selling lemonade, pop, and sandwiches. As he passed close to the grandstand, he noticed two young men fretting about. It was the Menches brothers from Canton, Ohio. Still in their twenties, Hiram took a liking to Charles and Frank. They reminded him of another young man – himself. Their innovativeness impressed him. Unlike the older vendors, they used newer and safer gas burning stoves. They also specialized in only one kind of sandwich – a pork sausage sandwich. This set them apart from the many ham sandwich stands. Hiram went up to Charles, the older of the two. “What’s troubling you boys?” he asked. Hopkins pondered this for a moment. He remembered former Hamburg Supervisor Andrew Stein had a butcher shop not too far away in the Village of Hamburg. “Have you tried Stein’s Meat Market in the Village?” offered Hiram. Frank Menches looked up at the clouds. He may have been only twenty, but as a competitive bicycle racer, he knew how to read the clouds. And the wind. It was blowing stiffly from the southwest, pushing up warm moist air from his Ohio hometown. It was going to rain. Yesterday was a banner day. He wasn’t sure about today. But he trusted his older brother. If Charles said the people will come rain or shine, then the people will come. Still, he didn’t want to order too much pork sausage. “Well, I’m Mr. Stein,” said the man behind the counter. “That’s not a lot of meat. It doesn’t make sense for me to slaughter an entire pig. I’m not sure I’d be able to sell the rest and it’s too hot and humid for me to keep it too long.” Stein held back the real reason. With the hog cholera epidemic, he simply didn’t have the pigs to spare. “What am I to do?” asked Frank. Frank thought about this for a moment. He and his brother had specialized in pork sausage sandwiches. Furthermore, he feared his customers would look down on ground beef. 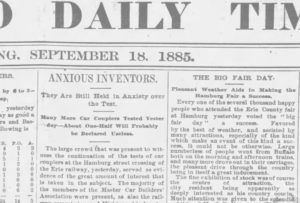 While accepted for its medicinal value (it was believed to be easier to digest), it wasn’t highly regarded by the class of people who typically ventured to county fairs. Frank left Andrew Stein’s meat market with the small package. He looked above to the clouds. The skies were no longer threatening. They were raining. The heavy downpour muddied the way back to the Fair. Frank sloshed his way to the Menches Brothers white tent. Frank plopped the hunk of meat on the plank and opened it. “Then that will give us some time to determine what to do with this,” said Frank as he revealed the ground beef concealed by the butcher paper. Frank fired up the stove as Charles eyed the meat. “Well,” said Charles, “if we can’t have pork sausage patties, we may as well try ground beef patties.” He pulled a handful of meat from the ball and formed a patty. When the griddle seemed the right temperature, he placed the patty on the hot iron. The brothers watched it fry. Its sweet smelling juices teased their nostrils. Once it got good and brown on the outside, they took the primordial hamburger off the grill and sampled it. It had no taste. Worse, it wasn’t cooked on the inside. “How are we going to cook the middle without burning the outside?” asked Frank. The brothers tried this. They pulled off this next attempt off the grill. They tasted it. Their faces winced. “At least it’s now cooked all the way through,” said Frank. It worked. The mix of spices and flavors created a tasty sandwich suited for candy concessionaires. The skies cleared by 11 o’clock. Thousands of people decided to venture to the fair in time for the 1 o’clock parade of livestock. The marquee race – a free-for-all – would immediately ensue. Once again, a dense crowd formed, particularly in front of the new grandstand. The Menches brothers stand, like the day before, became a flurry of activity. They barely had time to come up with a catchy carnival barker shout to convince fairgoers to purchase their new concoction. When it comes to the Erie County Fair, though, people will often buy something simply because it’s for sale. Especially when there’s a lot of people around the booth. Fortunately, the Menches brothers also sold candy, peanuts and popcorn confections. That attracted the crowd. They only had enough ground beef to make 20-25 hamburgers. The new sandwich proved popular. With barely a breather during the lunchtime rush, Frank and Charles didn’t have the luxury (or the need) to contemplate the significance of their innovative culinary invention. To them, it was simply a ground beef sandwich. It was only a sandwich they needed to sell at a certain price to make enough profit to insure their business remained sustainable. That their customized additional ingredients made it something different didn’t occur to them. And with that, a billion-dollar business – the world’s greatest invention – was born.